Introduction: When creating website documentation for my various projects, I always like to add drawings and figures to help explain the project. Inkscape (download) is one of my favorite tools, and does a great job of creating and editing vector drawings in the SVG format. Unfortunately, there is no good way to do animation from within Inkscape (at least not yet), so I needed a way to manually do animation from my SVG files. Solution: I created a small python script that reads in an SVG file and does a search-and-replace to update object colors, positions, rotations, etc. After updating the image, it renders it to a PNG or GIF file, and saves it as one frame of the final animation. The script reads in a detailed settings file that controls all aspects of the animation, including support for automatic GIF conversion, precise control over the index variable, and even allowing for multiple 'phases' of animation. Once all the individual frames have been created, you can use a tool such as gifsicle to create an animated GIF. Preview: For purposes of demonstration, I have created a simple image of a ball, shown below on the left. Using the SVGAni script, I created the animation of the color-changing ball shown below on the right, as well as at the top of this page. In the rest of this document, I will show you how to take one of your own SVG drawings, prepare it for animation, create the settings file, run the animation script, and create the animated GIF output file. index_start - This is the starting value of the index variable for this phase. index_end - This is the ending value of the index variable for this phase. steps - This is the total number of frames to produce for this phase. It includes both the start and end values, so if you want N values between the start and end, set this to N+2. If there are other objects that you want to animate, you can add unique custom tags to the other values. There are more examples of information replacements in the rest of this document. For this example, our SVG source file is now ready to go. ## Example: 'frame_' will become 'frame_0000.png', 'frame_0001.png', etc. ## The size of the output images, in pixels. ## Do you want the output images converted to gif? ## with names like [phase_0000], [phase_0001], etc. ## you don't need to import any extra modules. ## but the other two can be either integers or decimals. ## python's eval() function on replacement_string. More information about the possible replacement string formats is provided in the next section. If you like, you can look at the overall settings file used for the ball example: svgani.settings. Explanation of Eval Statements: As mentioned above, the animation process automatically sets up the index variable for each frame of the animation. 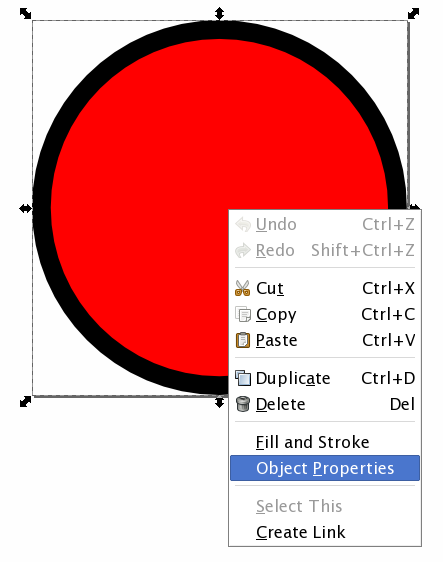 You can reference this index variable in the search-and-replace part of the settings file to dictate how an object's color, position, rotation, etc is controlled by the index value. To provide the most flexible solution, the replacement string from the settings file is evaluated using python's eval function. This allows for more complex behavior, and simplifies the creation and processing if the search-and-replace pairs. 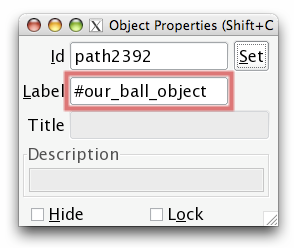 In the simple example above, the text string "ball_fill_color" will be replaced with "%02X%02X%02X" % (index, 0, 0). What this means is that the replacement string will be evaluated by python, and the resulting string substituted in for the search string. For our ball animation example, in phase 0, the index variable starts at 0, ends at 255, with 52 steps total. This replacement string is a little snippet of python's string formatting code, which is very similar to standard printf-style string formatting codes. Here, we are printing three numbers, the red, green, and blue values, in standard hex-color-code format. The code "%02X" means to print the value in upper-case hexadecimal, zero-padded to two digits. It performs this conversion for all three colors, and produces a six-digit color code. Notice that the values for green and blue are both fixed to 0, because they are not changing during the course of the animation. Only the red value, set to be equal to the index variable, is changing throughout this animation. If the index is going between 0 and 255, then this code would be evaluated to a value between -120 and +120. The (index / float(255)) part produces a value between 0.0 and 1.0, which is used to add in a proportional amount of the 240. If the index is going between 0.0 and 1.0, then this code would evaluate to be a single period of a cosine wave, scaled to be between -10 and +10. If you want an object to travel in a circle, you could set its x-coordinate to this, and set the y-coordinate in a similar way, but with the sin function instead. Users of other graphical animation packages (such as Adobe Flash) might be used to the ease-in and ease-out functions, where motion starts slowly/quickly and then accelerates/decelerates to the ending position. Using an eval string such as this one (with index going between 0.0 and 1.0) produces an ease-in effect between 0 and 30. The numbers start out slowly increasing, but then start to rapidly increase as the output numbers approach 30. Small exponents (here, 5) produce more constant velocities, while higher exponents produced a more profound ease-in effect, starting out very slow, with a rapid acceleration to high velocity movement at the very end. Similar to the example above. The subtraction from 30 produces values that start at 30, and slowly decrease, eventually accelerating towards 0. If you set index to go downward from 1.0 to 0.0, then this example will start at 0 and rapidly increase, eventually slowing down as it slowly approaches the value of 30. There are 2 phases with 104 total frames. Downloads: Click below to download a zip package of SVGAni. The package contains the script file, the settings file, and the original and modified versions of the SVG image file used in the examples. It also includes your very own copy of the GPL. If you find this script to be useful, please send me an email. I'm always interested to see who's using my software. Released 2013-02-26 - Fixed a small bug with the output PNG filename. Released 2009-05-21 - This is the initial release.